The two main types of rhubarb we are familiar with in the UK are natural, outdoor rhubarb and the forced variety. 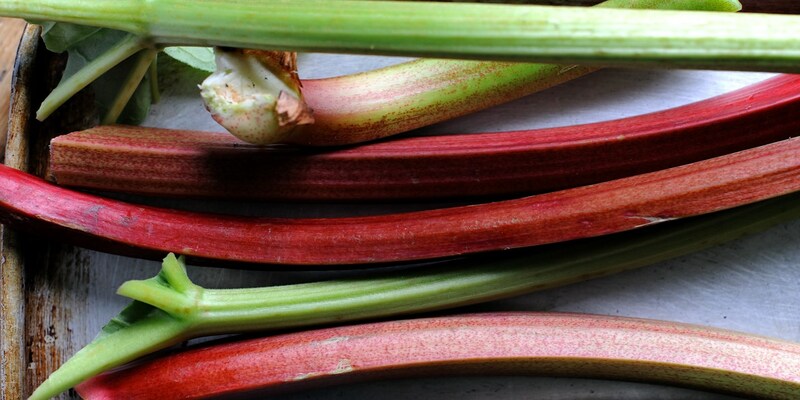 Forced rhubarb is grown by candlelight to create bright pink, tender stems and tends to be produced in the so-called ‘rhubarb triangle’ in Yorkshire. While rhubarb season proper heralds the start of spring, forced rhubarb is usually available from January until March - just in time for comforting crumbles and compotes. With its attractive colour and sweet tang, rhubarb pairs perfectly with creamy custard, and the combination is something of a nostalgic one for many - think school dinners and boiled sweets. Dominic Chapman’s Apple and rhubarb crumble recipe makes the perfect warming winter pudding, or try Martin Wishart’s Rhubarb tart. When the weather gets warmer incorporate rhubarb into a chilled dessert, such as Tom Aikens’ Rhubarb fool or Nathan Outlaw’s vivid Rhubarb trifle recipe. For a modern take on the classic pairing try Emily Watkins’ Baked custard recipe, served with a vibrant rhubarb granita. While commonly thought of as a fruit rhubarb is actually a vegetable, so don't be afraid of adding some of its tart sweetness to savoury recipes, too. Adam Stokes’ Duck breast recipe is served with a glorious rhubarb purée, the sharpness of the rhubarb perfectly offsetting the rich flavour of the duck.